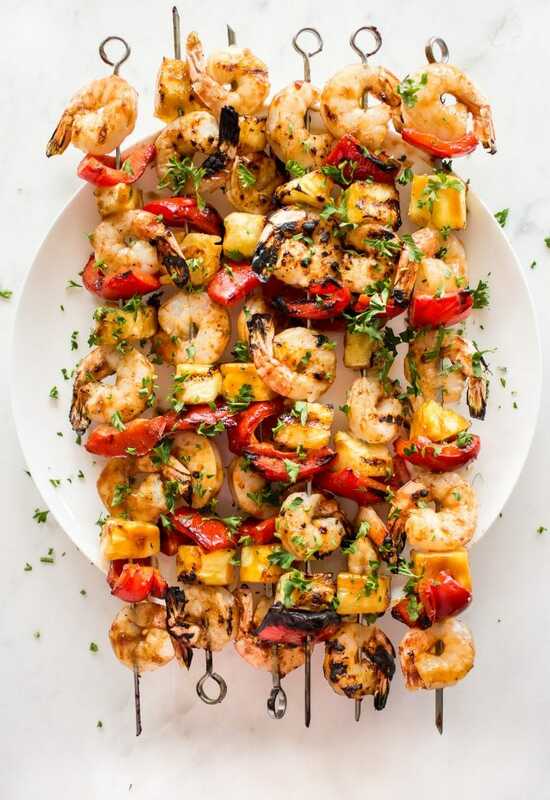 This pineapple shrimp skewers recipe is tasty, healthy, vibrant, and perfect for easy summer dinners. You will love these Hawaiian shrimp skewers! I have to say that I really like how this easy grilled shrimp skewers recipe turned out! The quick honey and BBQ sauce glaze not only tastes good, but it helps the pineapple caramelize when you grill it. 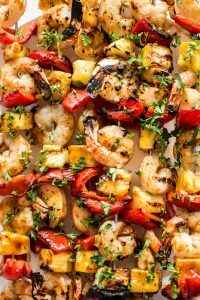 Shrimp and pineapple just go so well together, so making these skewers was a no-brainer for me. I added in some red pepper for an extra pop of color. You could definitely use green pepper instead (or as well) if you want. There is quite a bit of sweetness in this recipe, so green pepper would nicely balance it out. Red onions would also go well in these skewers if you’re looking to make these even more colorful. Pro tip: Make sure to cut the pineapple into fairly small pieces so they cook a bit since these skewers are on the BBQ for only around 8-10 minutes. Cooking shrimp on the grill is easy – I gave these shrimp skewers around 4 minutes/side. Not bad for a fast weeknight dinner, but you do have to be mindful not to overcook the shrimp. I admit I do like a good char on my grilled shrimp skewers, so I maaay have left them on the BBQ a little bit longer than I suggest in the recipe. I used a gas BBQ, so cooking time will vary depending on what BBQ/grill/grill pan you use. Start with my recipe as a guideline, and leave ’em on a bit longer if you prefer. Rice or a salad would go great! 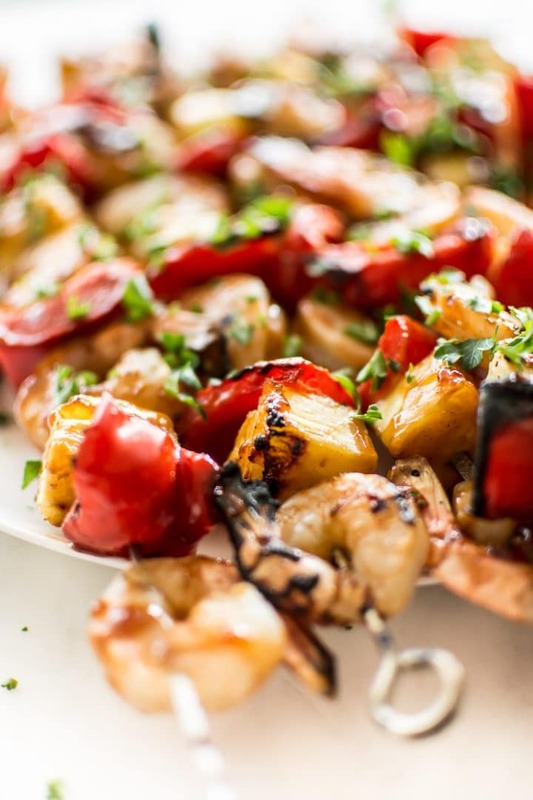 Hope you love this grilled shrimp kabob recipe! If using wooden skewers, it's a good idea to soak them for 30 minutes to reduce burning/splintering. Prep your shrimp and veggies. Add the BBQ sauce and honey to a small bowl and stir until combined. 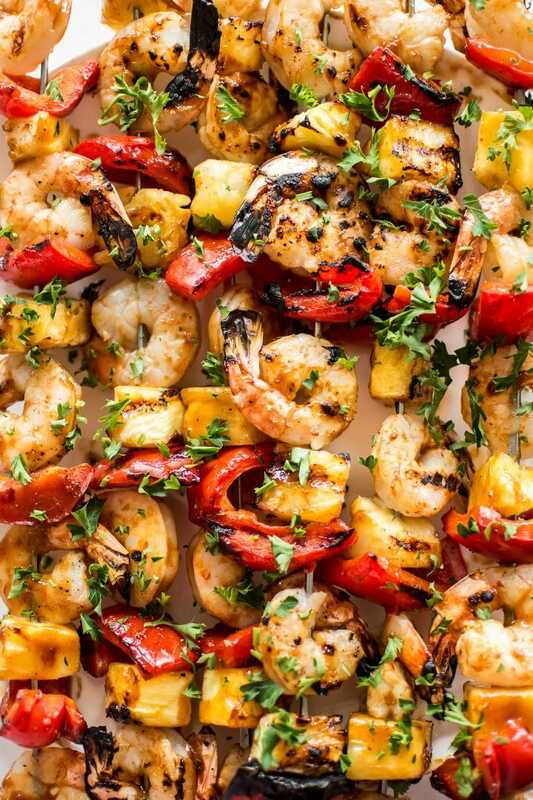 Thread the shrimp onto your skewers, along with the pineapple and red pepper pieces. Sprinkle with salt & pepper. Preheat BBQ/grill to high. Reduce heat to medium-high, and grill the skewers for about 4-5 minutes/side (or until they're cooked through), with the BBQ lid down. Baste with the sauce twice (once after flipping them). Keep in mind any BBQ/grill/grill pan is different, so actual cooking time may vary. I had a bit of pineapple left after making 6 large skewers. Serves 4 as long as you serve these skewers with a side (e.g. rice, salad, etc.). You may also like my grilled tequila lime shrimp skewers. Love summer dinners that are so easy and flavorful! These pineapple shrimp skewers definitely need to happen soon! Prettiest skewers I ever did see Natasha! And I’m sure they’re just as delicious! Pineapple and shrimp sound so yummy together! We go to Hawaii in 12 days, and my boys are obsessed with shrimp, so I can’t wait to make these! Oooh I am sure they will love them! Hawaii! So jealous haha. I’ve always wanted to go.